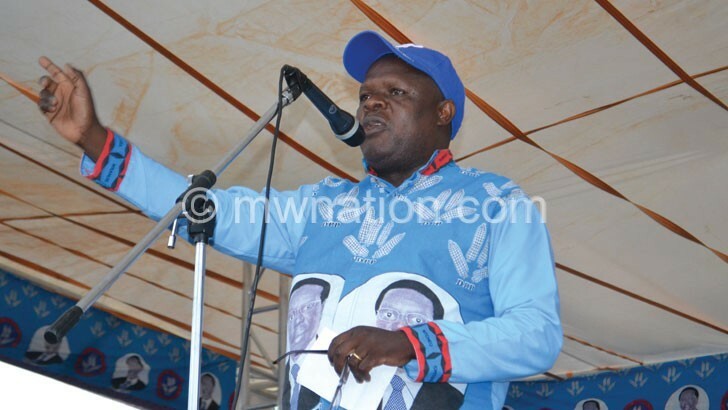 Governing Democratic Progressive Party (DPP) running mate Everton Chimulirenji has urged Malawians to conduct a peaceful campaign during the official period which starts tomorrow to May 19. He was speaking yesterday at Zingwangwa Secondary School Ground in Blantyre where he addressed a rally. The rally, which was marred by rain showers, was Chimulirenji’s first in the Southern Region since President Peter Mutharika appointed him as his running mate. He urged DPP members to conduct their campaigns peacefully and avoid intimidating and castigating their opponents. The DPP running mate said his next move is to hold political rallies in rural areas to ensure that the party wins the May 21 Tripartite Elections. On his part, DPP vice-president Kondwani Nankhumwa (South) warned the party leaders who are inactive to actively participate in the campaign period or quit. He observed that there are some senior party members who do not play any active role, saying there is need to work extra hard during the campaign for DPP to be re-elected come May. Traditional authorities from Ntcheu, notably Ganya, Chakhumbira and Njolomole also attended the rally.